Miriam Makeba died in 2008. So vast was her influence that she was dubbed "Mama Africa," and so firm was her grip on that title that speculation immediately raged as to whom could possibly assume her mantle. That debate is over. Benin-born, Grammy Award winner Angélique Kidjo now reigns and commands such global respect that she has been dubbed "Sister Africa." For once the Music Hype Machine got it right. Ms. Kidjo brought her high-powered act to the University of Massachusetts Amherst Fine Arts Center on Thursday night and transformed the building into a swaying, dancing village. You needed to be there to understand what a feat this was. The FAC is a cold, unlovable venue–a cavernous, windowless expanse of Brutalist concrete slabs whose architecture is evocative of East Berlin under Stalinism. If you can make that place rock, you can pop open graves and get skeletons to dance. 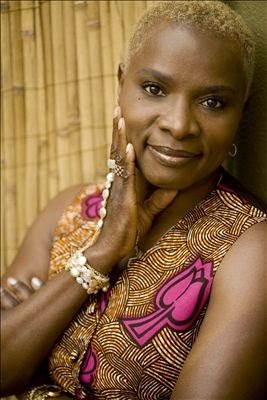 Kidjo is now based in New York City and belongs to the world, not just Benin. Her style is suitably au courant­—a veritable mash of pop, jazz, blues, folk, carnivalesque zouk, and soukous. For those unfamiliar with the latter two categories, souk is lively party music that developed on former French Caribbean islands such as Martinique and Guadeloupe; Benin was also a French colony, and Ms. Kidjo is fluent in French (plus English, Fon, and Yoruba). Soukous is a Congolese variant of rumba. The word translates "to shake," and few can do so with the facility and electric excitement of Angélique Kidjo. She informed the nearly full FAC that dancing at her concerts was a "rule." A rule, mind, not an option. And what a spitfire she is–think a muscular in-your-face mélange of Michael Jackson, Lady Gaga, James Brown, and the twirling, fight-like stances of West African dancers. Only Tina Turner rivals Kidjo for bodily attitude and insouciance. When Kidjo decides to spin, get out of her way–as she pointedly reminded her guitarist and bass player at several junctures during the concert when she nudged them to the parts of the stage to which she wished them to retreat! As I mentioned earlier, Kidjo is now a global phenomenon, which means it's a mistake to see her music as Beninese village music. She's the sort of force that can and has played with Bono, Herbie Hancock, Carlos Santana, Counting Crows, Alicia Keyes, Cyndi Lauper, and Philip Glass. She's covered songs by Jimi Hendrix, Aretha Franklin, Curtis Mayfield, and Miriam Makeba. If you must apply a label, the term Afropop is probably the best. Check out her smash hit "Africa," which got the FAC audience on its feet, and you can see how she fuses the germ of traditional styles with glittery pop. With a voice such as hers, Kidjo could sing algorithms and you'd be impressed. As glorious as her visual show was, though, my favorites moments were when she slowed the pace, stripped down the instrumentation (guitar, bass, two percussionists, and programmed sounds), and just sang. Kidjo delights in singing across rhythms, sometimes on the off-beat, but there was a magical moment in which she visibly took a slow song down a notch because she needed to allow the reverberations of her voice to die down before the next blast, lest she unleash a concretized cacophony.